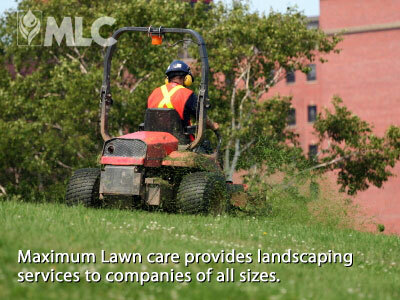 Residential and commercial customers depend on Maximum Lawn Care to keep green areas looking beautiful. We offer several maintenance packages, or you can pick and choose the services you want. Complete this form to request an estimate. All applicators are state-certified professionals. Five applications of granular pre-emergents, fertilizers and weed control. The first application usually happens in March; the last in November or December. All five emergent/fertilizer/weed control treatments included in the Basic Package plus grub worm control. Grub worm treatments usually occur in June or July. All five applications of emergent/fertilizer/weed control treatments in the Basic Package, grub worm control in the Standard Package, plus insecticide treatments to control suface-feeding insects like chiggers, ticks and fleas. Insecticide treatments are schedule when needed. Includes picking up all debris, mowing with sharp blades at the proper height, trimming around trees, sidewalks, curbs and other obstacles, and blowing clippings from all paved areas. Includes freshening existing hardwood mulch, spraying existing weeds and applying pre-emergents to help prevent weed growth. Seed is applied at a rate of 8#-10# per 100 sq ft and fertilized. Removes thatch—dead or decomposing grass and organic matter above the soil—which promotes growth. Removes small plugs of soil and grass so that oxygen, water and nutrients reach the root zone. Improves the lawn so that new seed germinates faster and better for a thick, lush lawn. Includes application of starter fertilizer. Have questions? Want to request an estimate? Simply complete this form.